This article is about the city in England. For other places with the same name, see Norwich (disambiguation). Norwich (/ˈnɒrɪdʒ, -ɪtʃ/ ( listen)) is a historic city in Norfolk, England. Situated on the River Wensum in East Anglia, it lies approximately 100 miles (161 km) north-east of London. It is the county town of Norfolk and is considered the capital of East Anglia, with a population of 141,300. From the Middle Ages until the Industrial Revolution, Norwich was the largest city in England after London, and one of the most important. The city is the most complete medieval city in the UK, including cobbled streets such as Elm Hill, Timber Hill and Tombland, ancient buildings such as St Andrew's Hall, half-timbered houses such as Dragon Hall, The Guildhall and Strangers' Hall, the Art Nouveau of the 1899 Royal Arcade, many medieval lanes and the winding River Wensum that flows through the city centre towards Norwich Castle. The city has two universities, the University of East Anglia and the Norwich University of the Arts, and two cathedrals, Norwich Cathedral and St John the Baptist Cathedral. Norwich is the only city containing part of a National Park, the Norfolk Broads, and it also holds the largest permanent undercover market in Europe. The urban area of Norwich had a population of 213,166 according to the 2011 Census. The parliamentary seats cross over into adjacent local-government districts. A total of 132,512 (2011 census) people live in the City of Norwich and the population of the Norwich Travel to Work Area (i.e., the self-contained labour market area in and around Norwich in which most people live and commute to work) is 282,000 (mid-2009 estimate). Norwich is the fourth most densely populated local-government district in the East of England, with 3,480 people per square kilometre (8,993 per square mile). In May 2012, Norwich was designated England's first UNESCO City of Literature. One of the UK's most popular tourist destinations, it was voted by The Guardian in 2016 as the "happiest city to work in the UK"  and in 2013 as one of the best small cities in the world by The Times Good University Guide. In 2018, Norwich was voted one of the "Best Places To Live" in the UK by The Sunday Times. The capital of the Iceni tribe was a settlement located near to the village of Caistor St. Edmund on the River Tas approximately 8 kilometres (5 mi) to the south of modern-day Norwich. Following an uprising led by Boudica around AD 60 the Caistor area became the Roman capital of East Anglia named Venta Icenorum, literally "the marketplace of the Iceni". The Roman settlement fell into disuse around 450 and the Anglo-Saxons settled on the site of the modern city between the 5th and 7th centuries, founding the towns of Northwic (from which Norwich gets its name), Westwic (at Norwich-over-the-Water) and the secondary settlement at Thorpe. According to a local rhyme, the demise of Venta Icenorum led to the development of Norwich: "Caistor was a city when Norwich was none, Norwich was built of Caistor stone." Norwich Cathedral is one of the great Norman buildings of England. There are two suggested models of development for Norwich. It is possible that three separate early Anglo-Saxon settlements, one on the north of the river and two either side on the south, joined together as they grew or that one Anglo-Saxon settlement, on the north of the river, emerged in the mid-7th century after the abandonment of the previous three. The ancient city was a thriving centre for trade and commerce in East Anglia in 1004 when it was raided and burnt by Swein Forkbeard the Viking king of Denmark. Mercian coins and shards of pottery from the Rhineland dating from the 8th century suggest that long-distance trade was happening long before this. Between 924 and 939, Norwich became fully established as a town, with its own mint. The word Norvic appears on coins across Europe minted during this period, in the reign of King Athelstan. The Vikings were a strong cultural influence in Norwich for 40 to 50 years at the end of the 9th century, setting up an Anglo-Scandinavian district near the north end of present day King Street. At the time of the Norman Conquest the city was one of the largest in England. The Domesday Book states that it had approximately 25 churches and a population of between 5,000 and 10,000. It also records the site of an Anglo-Saxon church in Tombland, the site of the Saxon market place and the later Norman cathedral. Norwich continued to be a major centre for trade, the River Wensum being a convenient export route to the River Yare and Great Yarmouth, which served as the port for Norwich. Quern stones and other artefacts from Scandinavia and the Rhineland have been found during excavations in Norwich city centre. These date from the 11th century onwards. Norwich Castle was founded soon after the Norman Conquest. The Domesday Book records that 98 Saxon homes were demolished to make way for the castle. The Normans established a new focus of settlement around the Castle and the area to the west of it: this became known as the "New" or "French" borough, centred on the Normans' own market place which survives to the present day as Norwich Market. In 1096, Herbert de Losinga, Bishop of Thetford, began construction of Norwich Cathedral. The chief building material for the Cathedral was limestone, imported from Caen in Normandy. To transport the building stone to the site, a canal was cut from the river (from the site of present-day Pulls Ferry), all the way up to the east wall. Herbert de Losinga then moved his See there to what became the cathedral church for the Diocese of Norwich. The Bishop of Norwich still signs himself Norvic. Norwich received a royal charter from Henry II in 1158, and another one from Richard the Lionheart in 1194. Following a riot in the city in 1274, Norwich has the distinction of being the only complete English city to be excommunicated by the Pope. The first recorded presence of Jews in Norwich is 1134. In 1144, the Jews of Norwich were accused of ritual murder after a boy (William of Norwich) was found dead with stab wounds. William acquired the status of martyr and was subsequently canonised. Pilgrims made offerings to a shrine at the Cathedral (largely finished by 1140) up to the 16th century, but the records suggest there were few of them. In 1174, Norwich was sacked by the Flemings. In February 1190, all the Jews of Norwich were massacred except for a few who found refuge in the castle. At the site of a medieval well, the bones of 17 individuals, including 11 children, were found in 2004 by workers preparing the ground for construction of a Norwich shopping centre. The remains were determined by forensic scientists to be most probably the remains of such murdered Jews, and a DNA expert determined that the victims were all related, so that they most probably came from one Ashkenazi Jewish family. The study of these remains was featured in an episode of the BBC television documentary series History Cold Case. In 1216, the castle fell to Louis, Dauphin of France and Hildebrand's Hospital was founded, followed ten years later by the Franciscan Friary and Dominican Friary. The Great Hospital dates from 1249 and the College of St Mary in the Field from 1250. In 1256, Whitefriars was founded. In 1266 the city was sacked by the "Disinherited". It has the distinction of being the only English city ever to be excommunicated, following a riot between citizens and monks in 1274. As a penance, St Ethelbert's Gate, one of the entrances to the cathedral priory, was constructed by Norwich citizens. In 1278 the Cathedral received final consecration. In 1290 the city flooded. Austin Friary was founded in that year. The engine of trade was wool from Norfolk's sheepwalks. Wool made England rich, and the staple port of Norwich "in her state doth stand With towns of high'st regard the fourth of all the land", as Michael Drayton noted in Poly-Olbion (1612). The wealth generated by the wool trade throughout the Middle Ages financed the construction of many fine churches, so that Norwich still has more medieval churches than any other city in Western Europe north of the Alps. Throughout this period Norwich established wide-ranging trading links with other parts of Europe, its markets stretching from Scandinavia to Spain and the city housing a Hanseatic warehouse. To organise and control its exports to the Low Countries, Great Yarmouth, as the port for Norwich, was designated one of the staple ports under the terms of the 1353 Statute of the Staple. From 1280 to 1340 the city walls were built. At around 4 km (2.5 miles), these walls, along with the river, enclosed a larger area than that of the City of London. However, when the city walls were constructed it was made illegal to build outside them, inhibiting expansion of the city. Around this time, the city was made a county corporate and became the seat of one of the most densely populated and prosperous counties of England. Part of these walls remain standing today. The year 1549 saw an unprecedented rebellion in Norfolk. Unlike popular challenges elsewhere in the Tudor period, it appears to have been Protestant in nature. For several weeks Kett's rebels camped outside Norwich on Mousehold Heath and took control of the city, with the support of many of its poorer inhabitants. Unusually in England, it divided the city and appears to have linked Protestantism with the plight of the urban poor. In the case of Norwich this process was underscored later by the arrival of Dutch and Flemish "Strangers" fleeing persecution from the Catholics and eventually numbering as many as one third of the city's population. Large numbers of such exiles came to the city, especially Flemish Protestants from the Westkwartier ("Western Quarter"), the region in the Southern Netherlands where the first Calvinist fires of the Dutch Revolt had spread. Inhabitants of Ypres in particular chose Norwich above other destinations. Perhaps in response to Kett, Norwich became the first provincial city to initiate compulsory payments for a civic scheme of poor relief, which it has been claimed led to its wider introduction, forming the basis of the later Elizabethan Poor Law of 1597–98. Norwich has traditionally been the home of various minorities, notably French Huguenot and Belgian Walloon communities in the 16th and 17th centuries. The great "Stranger" immigration of 1567 brought a substantial Flemish and Walloon community of Protestant weavers to Norwich, where they are said to have been made welcome. The merchant's house which was their earliest base in the city — now a museum — is still known as Strangers' Hall. It seems that the Strangers were integrated into the local community without much animosity, at least among the business fraternity, who had the most to gain from their skills. Their arrival in Norwich boosted trade with mainland Europe and fostered a movement toward religious reform and radical politics in the city. The Norwich Canary was first introduced into England by Flemings fleeing from Spanish persecution in the 16th century. They brought with them not only advanced techniques in textile working but also pet canaries, which they began to breed locally, the little yellow bird eventually becoming, in the 20th century, a mascot of the city and the emblem of its football club, Norwich City F.C., who are nicknamed The Canaries. Printing was introduced to the city in 1567 by Anthony de Solempne, one of the "Strangers", but it did not take root and had died out by about 1572. Across the Eastern Counties Oliver Cromwell's powerful Eastern Association was eventually dominant. However, to begin with, there had been a large element of Royalist sympathy within Norwich, which seems to have experienced a continuity of its two-sided political tradition throughout the period. Bishop Matthew Wren was a forceful supporter of Charles I. Nonetheless, Parliamentary recruitment took hold. The strong Royalist party was stifled by a lack of commitment from the aldermen and isolation from Royalist-held regions. Serious inter-factional disturbances culminated in "The Great Blow" of 1648, when Parliamentary forces tried to quell a Royalist riot. The latter's gunpowder was set off by accident in the city centre, causing mayhem. (According to Hopper 2004, the explosion "ranks among the largest of the century".) Stoutly defended though East Anglia was by the Parliamentary army, there are said to have been pubs in Norwich where the king's health was still drunk and the name of the Protector sung to ribald verse. At the cost of some discomfort to the Mayor, the moderate Joseph Hall was targeted because of his position as Bishop of Norwich. Norwich was marked in the period after the Restoration of 1660 and the ensuing century by a golden age of its cloth industry, comparable only to those in the West Country and Yorkshire. But unlike other cloth-manufacturing regions, Norwich weaving brought greater urbanisation, substantially concentrated in the surrounds of the city itself, creating an urban society, with features such as leisure time, alehouses, and other public forums of debate and argument. Founded in 1771, the Norfolk and Norwich Hospital cared for the city's poor and sick. It closed in 2003 after services were moved to the Norfolk and Norwich University Hospital. Norwich in the late 17th century was riven politically. Churchman Humphrey Prideaux described "two factions, Whig and Tory … and both contend for their way with the utmost violence." Nor did the city accept the outcome of the 1688 Glorious Revolution with a unified voice. The pre-eminent citizen, Bishop William Lloyd, would not take the oaths of allegiance to the new monarchs. One report has it that in 1704 the landlord of Fowler's alehouse "with a glass of beer in hand, went down on his knees and drank a health to James the third, wishing the Crowne [sic] well and settled on his head." In 1716, at a play at the New Inn, the Pretender was cheered and the audience booed and hissed every time King George's name was mentioned. In 1722 supporters of the king were said to be "hiss'd at and curst as they go in the streets," and in 1731 "a Tory mobb, in a great body, went through several parts of this city, in a riotous manner, cursing and abusing such as they knew to be friends of the government. "[b] But the Whigs gradually gained control and by the 1720s they had successfully petitioned Parliament to allow all adult males working in the textile industry to take up the freedom, on the correct assumption that they would vote Whig. But it had the effect of boosting the city's popular Jacobitism, says Knights, and contests of the kind described continued in Norwich well into a period in which political stability had been discerned at a national level. The city's Jacobitism perhaps only ended with 1745, well after it had ceased to be a significant movement outside Scotland. Despite the Highlanders reaching Derby and Norwich citizens mustering themselves into an association to protect the city, some Tories refused to join in and the vestry of St Peter Mancroft resolved that it would not ring its bells to summon the defence. Still, it was the end of the road for Norwich Jacobites, and the Whigs organised a notable celebration after the Battle of Culloden. What the events of this period illustrate is that Norwich had had a strong tradition of popular protest favouring Church and Stuarts and attached to the street and alehouse. Knights tells how in 1716 the mayoral election had ended in a riot, with both sides throwing "brick-ends and great paving stones" at each other. A renowned Jacobite watering-hole, the Blue Bell Inn (nowadays The Bell Hotel), owned in the early 18th century by the high-church Helwys family, became the central rendezvous of the Norwich Revolution Society in the 1790s. Britain's first provincial newspaper, the Norwich Post, appeared in 1701. By 1726 there were rival Whig and Tory presses and even in mid-century, three-quarters of the males in some parishes were literate. [c] The Norwich municipal library claims an excellent collection of these newspapers, also a folio collection of scrapbooks on 18th-century Norwich politics, which Knights says are "valuable and important". Norwich alehouses had 281 clubs and societies meeting in them in 1701, and at least 138 more were formed before 1758. The Theatre Royal opened in 1758, alongside the city's stage productions in inns and puppet shows in rowdy alehouses. In 1750 Norwich could boast nine booksellers and after 1780 a "growing number of circulating and subscription libraries". Knights 2004 says: "[All this] made for a lively political culture, in which independence from governmental lines was particularly strong, evident in campaigns against the war with America and for reform... in which trade and the impact of war with Revolutionary France were key ingredients. The open and contestable structure of local government, the press, the clubs and societies, and dissent all ensured that politics overlapped with communities bound by economics, religion, ideology and print in a world in which public opinion could not be ignored." Amid this metropolitan culture the city burghers had built a sophisticated political structure. Freemen, who had the right to trade and to vote at elections, numbered about 2,000 in 1690, rising to over 3,300 by the mid-1730s. With growth partly the result of political manipulation, their numbers did at one point reach one-third of the adult male population. This was notoriously the age of "rotten" and "pocket" boroughs, and Norwich was unusual in having such a high proportion of its citizens able to vote. "Of the political centres where the Jacobin propaganda had penetrated most deeply only Norwich and Nottingham had a franchise deep enough to allow radicals to make use of the electoral process." "Apart from London, Norwich was probably still the largest of those boroughs which were democratically governed," says Jewson 1975, describing other towns under the control of a single fiefdom. In Norwich, he says, a powerful Anglican establishment, symbolised by the Cathedral and the great church of St Peter Mancroft was matched by scarcely less powerful congeries of Dissenters headed by the wealthy literate body [of Unitarians] worshipping at the Octagon Chapel. In the middle of political disorders of the late 18th century, Norwich intellectual life flourished. It contained one, so far unmentioned characteristic: Harriet Martineau wrote of the city's literati of the period, which included such people as William Taylor, one of the first German scholars in England. The city "boasted of her intellectual supper-parties, where, amidst a pedantry which would now make laughter hold both his sides, there was much that was pleasant and salutary: and finally she called herself The Athens of England." Notwithstanding Norwich's hitherto industrial prosperity, the wool trade was experiencing intense competition by the 1790s, from Yorkshire woollens and increasingly from Lancashire cottons. The effects were aggravated by the loss of continental markets after Britain went to war with France in 1793. [d] The early 19th century saw de-industrialisation accompanied by bitter squabbles. The 1820s were marked by wage cuts and personal recrimination against owners. So amid the rich commercial and cultural heritage of its recent past, Norwich suffered in the 1790s from incipient decline exacerbated by a serious trade recession. As early in the war as 1793, a major city manufacturer and government supporter, Robert Harvey, complained of low order books, languid trade and a doubling of the poor rate. [e] As with many generations of their Norwich forebears, the hungry poor took their complaints on to the streets. Hayes describes a meeting of 200 people in a Norwich public house, at which "Citizen Stanhope" spoke. [f] The gathering "[roared its] applause at Stanhope's declaration that the Ministers, unless they changed their policy, deserved to have their heads brought to the block; – and if there was a people still in England, the event might turn out to be so." Hayes says that "the outbreak of war, in bringing the worsted manufacture almost to a standstill and so plunging the mass of the Norwich weavers into sudden distress made it almost inevitable that a crude appeal to working-class resentment should take the place of a temperate process of education which the earliest reformers had intended." By 1795 it was not just the Norwich rabble who were causing the government concern. In April that year the Norwich Patriotic Society was established, its manifesto declaring "that the great end of civil society was general happiness; that every individual … had a right to share in the government …" In December the price of bread reached its highest yet, and in May 1796, when William Windham was forced to seek re-election following his appointment as war secretary, he only just held his seat. [g] Amid the same disorder and violence as was often the case with Norwich elections, it was only by the narrowest of margins that the radical Bartlett Gurney, campaigning on the platform of "Peace and Gurney – No More War – No more Barley Bread" failed to unseat him. Though informed by issues of recent national importance, the two-sided political culture of Norwich in the 1790s cannot be totally disconnected from local tradition. Two features stand out from a political continuum of three centuries. The first is the dichotomous power balance. From at least the time of the Reformation, there is a record of Norwich as a "two-party city". In the mid-16th century the weaving parishes actually fell under the control of opposition forces, as Kett's rebels held the north of the river, in support of poor cloth workers. Secondly, there seems to be a case for saying that with this tradition of two-sided disputation, the city had over a long period of time developed an infrastructure, evident in her many cultural and institutional networks of politics, religion, society, news media and the arts, whereby argument could be managed short of outright confrontation. Indeed at a time of hunger and tension on the Norwich streets, with the alehouse crowds ready to have "a Minister's head brought to the block", the Anglican and Dissenting clergy were doing their best to conduct a collegiate dialogue, seeking common ground, and reinforcing the same well-mannered civic tradition of consensus as that illustrated by historians of earlier periods. In 1797 Thomas Bignold, a 36-year-old wine merchant and banker, founded the first Norwich Union Society. Some years earlier, when he moved from Kent to Norwich, Bignold had been unable to find anyone willing to insure him against the threat from highwaymen. With the entrepreneurial thought that nothing was impossible, and aware that in a city built largely of wood the threat of fire was uppermost in people's minds, Bignold formed the "Norwich Union Society for the Insurance of Houses, Stock and Merchandise from Fire". The new business, which became known as the Norwich Union Fire Insurance Office, was a "mutual" enterprise. Norwich Union was later to become the country's largest insurance giant. From earliest times, Norwich was a textile centre. In the 1780s, the manufacture of Norwich shawls became an important industry and remained so for nearly a hundred years. The shawls were a high-quality fashion product and rivalled those made in other towns such as Paisley (which entered shawl manufacture in about 1805, some 20 or more years after Norwich). With changes in women's fashion in the later Victorian period, the popularity of shawls declined and eventually manufacture ceased. Examples of Norwich shawls are now highly sought after by collectors of textiles. Norwich's geographical isolation was such that until 1845, when a railway connection was established, it was often quicker to travel to Amsterdam by boat than to London. The railway was introduced to Norwich by Morton Peto, who also built the line to Great Yarmouth. From 1808 to 1814, Norwich had a station in the shutter telegraph chain that connected the Admiralty in London to its naval ships in the port of Great Yarmouth. A permanent military presence was established in the city with the completion of Britannia Barracks in 1897. The Bethel Street and Cattle Market Street drill halls were built around the same time. In the early part of the 20th century Norwich still had several major manufacturing industries. Among them were the manufacture of shoes (for example the Start-rite and Van Dal brands), clothing, joinery (including the cabinet makers and furniture retailer Arthur Brett and Sons, which continues in business in the 21st century), and structural engineering, as well as aircraft design and manufacture. Important employers included Boulton & Paul, Barnards (ironfounders, and inventors of machine produced wire netting), and electrical engineers Laurence Scott and Electromotors. Norwich also has a long association with chocolate manufacture, primarily through the local firm of Caley's, which began as a manufacturer and bottler of mineral water and later diversified into making chocolate and Christmas crackers. The Caley's cracker-manufacturing business was taken over by Tom Smith in 1953, and the Norwich factory in Salhouse Road eventually closed in 1998. Caley's was acquired by Mackintosh in the 1930s, and merged with Rowntree's in 1969 to become Rowntree-Mackintosh. Finally, it was bought by Nestlé and closed in 1996, with all operations moving to York after an association of 120 years with Norwich. The demolished factory stood on the site of what is now the Chapelfield development. Caley's chocolate has since made a reappearance as a brand in the city, although it is no longer made in Norwich. Jarrolds, established in 1810, was a nationally well-known printer and publisher. In 2004, after nearly 200 years, the printing and publishing businesses were sold. Today, the company remains privately owned and the Jarrold name is now best known and recognised as being that of Norwich's only independent department store. The company is also active in property development in Norwich and has a business training division. The city was home to a long-established tradition of brewing, with several large breweries continuing in business into the second half of the century. The main ones were Morgans, Steward and Patteson, Youngs Crawshay and Youngs, Bullard and Son, and the Norwich Brewery. Despite takeovers and consolidation in the 1950s and 1960s, by the 1970s only the Norwich Brewery (owned by Watney Mann and on the site of Morgans) remained. That too closed in 1985 and was subsequently demolished. Only microbreweries can be found today. It was stated by Walter Wicks in his book that Norwich once had "a pub for every day of the year, and a church for every Sunday". This was in fact significantly under the actual amount, and the highest number of pubs in the city was in the year 1870, with over 780 beer-houses. A Licensing Act in 1872, had several detrimental effects for landlords and customers, with the total number of pubs dropping to 634. [citation needed] A "Drink Map" was produced in 1892 by the Norwich and Norfolk Gospel Temperance Union, which showed 631 pubs in and around the city centre and surrounding districts. By 1900, the number had dropped to 441 pubs within the City Walls. The title of a pub for every day of the year survived until 1966, when the Chief Constable informed the Licensing Justices that only 355 licences were still operative[citation needed], with the number slowly shrinking, as over 25 have closed in the last decade. As of 2018, around 100 pubs still trade in the city centre and surrounding areas. Norwich suffered extensive bomb damage during World War II, affecting large parts of the old city centre and Victorian terrace housing around the centre. Industry and the rail infrastructure also suffered. The heaviest raids occurred on the nights of 27/28 and 29/30 April 1942; as part of the Baedeker raids (so-called because Baedeker's series of tourist guides to the British Isles were used to select propaganda-rich targets of cultural and historic significance rather than strategic importance). Lord Haw-Haw made reference to the imminent destruction of Norwich's new City Hall (completed in 1938), although in the event it survived unscathed. Significant targets hit included the Morgan's Brewery building, Colman's Wincarnis works, City Station, the Mackintosh chocolate factory, and shopping areas including St Stephen's St and St Benedict's St, the site of Bond's department store (now John Lewis) and Curl's department store. 229 citizens were killed in the two Baedeker raids with 1000 others injured, and 340 by bombing throughout the war—giving Norwich the highest air raid casualties in Eastern England. Out of the 35,000 domestic dwellings in Norwich, 2,000 were destroyed, and another 27,000 suffered some damage. In 1945 the city was also the intended target of a brief V2 rocket campaign, though all these missed the city. (Sources: 4 Civil Defence Region bombing reports at National Archive; M J F Bowyer "Air Raid"). In 1960, the inner-city district of Richmond, locally known as 'the Village on the Hill' was condemned as slums, and many residents were forced to leave due to compulsory purchase orders on the old terraces and lanes. The whole borough was demolished, which consisted of around 56 acres of existing streets, including 833 dwellings (612 considered unfit for human habitation), 42 shops, 4 offices, 22 public houses and 2 schools. Communities were moved to high rise buildings such as Normandie Tower, or new housing estates such as the Tuckswood Estate, that were being built around the city at the time. A new road, Rouen Road was developed in the area's place, which consists mainly of light industrial units and council flats. Ber Street, a once historical main road into the city had its whole eastern side demolished. The final part of St Peters Street (at the top of St Peter Mancroft church), along with large Georgian houses at the top of Bethel Street was demolished to make way for a car park for the new City Library in 1961. This later burnt down in April 1994, and in 2001, The Forum was built in its place. Many more buildings were demolished during the construction of the inner-ring road, which saw an ancient road junction, Stump Cross with Tudor and Georgian buildings in Magdalen Street, Botolph Street and most notably Pitt Street, cleared to make way for a fly-over and Brutalist concrete shopping centre, Anglia Square and office blocks such as HMSO building Sovereign House. Other areas affected by the ring-road were Grapes Hill, a once narrow lane lined with Georgian and Victorian cottages, being cleared and widened to form a dual carriageway leading up in to a roundabout in 1970. Shortly before the construction of this roundabout, the city's old Drill Hall was demolished, along with parts of the original city wall and other larger townhouses along the start of Unthank Road. Its unusual name comes from the Unthank family who were local landowners. The north westerly corner of Chapelfield Gardens was also cut off in order to accommodate the new roundabout. About a mile of Georgian houses along Chapelfield Road and Queens Road; which saw many houses that were built into the city walls, were bulldozed in 1964. This included the surrounding area near Vauxhall Street, consisting of Georgian cottages which were condemned as slums. Post-war housing and maisonettes flats now stand where the Rookery slums once did. Some aspects of The '45 Plan were put into action, which saw large three-story Edwardian houses in Grove Avenue and Grove Road, and other large properties on Southwell Road, demolished in 1962 to make way for flat-roofed single story style maisonettes, that still stand today. Heigham Hall, a large Victorian manor house was also demolished in 1963, to build Dolphin Grove flats. Further housing developments in the private and public sector took place after the Second World War, partly to accommodate the growing population of the city and also to replace condemned and bomb damaged areas, such as the Heigham Grove district between Barn Road and Old Palace Road, and West Pottergate off Dereham Road. Other central streets such as St Stephens Street was widened, firstly by Norwich Union's new office blocks and shortly after redeveloped with new buildings after it suffered extensive damage during the Baedeker raids. On Surrey Street, many six-storey Georgian buildings were demolished to make way for Norwich Union's office. Other notable buildings that were lost were three theatres, Norwich Hippodrome on St Giles Street, which is now a multi-storey car park, The Grosvenor Rooms and the Electric Theatre of Prince of Wales Road, The Corn Hall on Exchange Street, the Free Library on Duke Street and the Great Eastern Hotel, that stood facing Norwich Station. In 1976 the city's pioneering spirit was on show when Motum Road in Norwich, allegedly the scene of "a number of accidents over the years", became the third road in Britain to be equipped with sleeping policemen, intended to encourage adherence to the road's 30 mph (48 km/h) speed limit. The bumps, installed at intervals of 50 and 150 yards, stretched 12 feet across the width of the road and their curved profile was, at its highest point, 4 inches (10 cm) high. The responsible quango gave an assurance that the experimental devices would be removed not more than one year after installation. From 1980 to 1985 the City became a frequent focus of national media due to the squatting of Argyle Street, a Victorian street that was demolished in 1986, despite being the last street left to survive the Richmond Hill redevelopment. On 23 November 1981, a minor F0/T1 tornado struck Norwich as part of the record-breaking nationwide tornado outbreak on that day, causing minor damage in Norwich city centre and surrounding suburbs. Norwich has been governed by two tiers of local government since the implementation of the Local Government Act 1972. The upper tier is Norfolk County Council, which manages strategic services such as schools, social services and libraries across the county of Norfolk. The lower tier is Norwich City Council, which manages local services such as housing, planning, leisure and tourism. The ceremonial head of the city is the Lord Mayor; though now simply a ceremonial position, in the past the office carried considerable authority, with executive powers over the finances and affairs of the city council. As of 2018-2019[update], the Lord Mayor is Cllr. Martin Schmierer, and the Sheriff Ros Brown. The office of mayor of Norwich dates from 1403 and was raised to the dignity of lord mayor in 1910 by Edward VII "in view of the position occupied by that city as the chief city of East Anglia and of its close association with His Majesty". The title was regranted on local government reorganisation in 1974. From 1404 the citizens of Norwich, as a county corporate, had the privilege of electing two sheriffs. Under the Municipal Corporations Act 1835 this number of sheriffs was reduced to one, and it became an entirely ceremonial post. Both Lord Mayor and Sheriff are elected at the council's annual meeting. In October 2006, the Department for Communities and Local Government produced a Local Government White Paper inviting councils to submit proposals for unitary restructuring. Norwich submitted its proposal in January 2007, which was rejected in December 2007, as it did not meet all the rigorous criteria for acceptance. In February 2008, the Boundary Committee for England (from 1 April 2010 incorporated in the Local Government Boundary Commission for England), was asked to consider alternative proposals for the whole or part of Norfolk, including whether Norwich should become a unitary authority, separate from Norfolk County Council. In December 2009, the Boundary Committee recommended a single unitary authority covering all of Norfolk, including Norwich. However, in February 2010, it was announced that, contrary to the December 2009 recommendation of the Boundary Committee, Norwich would be given separate unitary status. The proposed change was strongly resisted, principally by Norfolk County Council and the Conservative opposition in Parliament. Reacting to the announcement, Norfolk County Council said it would look to challenge the decision in the courts. A letter was leaked to the local media, in which the Permanent Secretary for the Department for Communities and Local Government noted that the decision did not meet all the criteria and that the risk of it "being successfully challenged in judicial review proceedings is very high." The Shadow Local Government and Planning Minister, Bob Neill, stated that should the Conservative Party win the 2010 general election, they would reverse the decision. Following the 2010 general election, Eric Pickles was appointed Secretary of State for Communities and Local Government in a Conservative–Liberal Democrat coalition government. According to press reports, he instructed his department to take urgent steps to reverse the decision and maintain the status quo in line with the Conservative Party manifesto. However, the unitary plans were supported by the Liberal Democrat group on the city council, and by Simon Wright, LibDem MP for Norwich South, who intended to lobby the party leadership to allow the changes to go ahead. The Local Government Act 2010 to reverse the unitary decision for Norwich (and Exeter and Suffolk) received Royal Assent in December 2010. The disputed award of unitary status had meanwhile been referred to the High Court, and in June 2010 the court ruled it unlawful, and revoked it; the city failed to attain unitary status. Since 1298 Norwich has returned two members of parliament to the House of Commons. Until 1950 the city was an undivided constituency, returning two MPs. Since that date the area has been divided between two single-member constituencies: Norwich North and Norwich South. Both constituencies have proved to be marginal seats in recent elections; until 2010 switching between the Labour and Conservative parties. 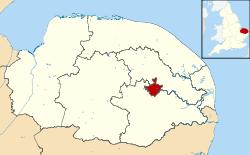 Norwich North, which includes some rural wards of Broadland District, was held by Labour from 1950 to 1983 when it was gained by the Conservatives. Labour regained the seat in 1997, holding it until a by-election in 2009. The current MP is the Conservative, Chloe Smith, who held the seat in the 2015 General Election. Norwich South, which includes part of South Norfolk District, was held by Labour from February 1974 to 1983 when it was gained by the Conservatives. John Garrett regained the seat for Labour in 1987. Charles Clarke became Labour MP for Norwich South in 1997. In the 2010 General Election, Labour lost the seat to the Liberal Democrats, with Simon Wright becoming MP. At the 2015 General Election, Clive Lewis regained the seat for Labour. In the 2017 General Election, both the incumbent 2015 MPs held their seats. The United Kingdom Census 2011 reported a resident population for the City of Norwich of 132,512, a 9% increase over the 2001 census. The urban or built-up area of Norwich had a population of 213,166 according to the 2011 census. This area extends beyond the city boundary, with extensive suburban areas on the western, northern and eastern sides, including Costessey, Taverham, Hellesdon, Bowthorpe, Old Catton, Sprowston and Thorpe St Andrew. The parliamentary seats cross over into adjacent local-government districts. The population of the Norwich Travel to Work Area (i. e. the self-contained labour-market area in and around Norwich in which most people live and commute to work) is 282,000 (mid-2009 estimate). Norwich is the fourth most densely populated local-government district in the East of England, with 3,480 people per square kilometre (8,993 per square mile). In 2011 the racial composition of Norwich's population was 90.9% White (84.7% White British, 0.7% White Irish, 0.1% Gypsy or Irish Traveller, 5.4% Other White), 4.5% Asian (1.3% Indian, 0.2% Pakistani, 0.4% Bangladeshi, 1.3% Chinese, 1.3% Other Asian), 2.3% of mixed race (0.5% White and Black Caribbean, 0.5% White and Black African, 0.7% White and Asian, 0.6% Other Mixed), 1.6% Black (1.3% African, 0.2% Caribbean, 0.1% Other Black), 0.5% Arab and 0.4% of other ethnic heritage. In terms of religion, 44.9% of the population are Christian, 2% are Muslim, 0.8% are Hindu, 0.7% are Buddhist, 0.2% are Jewish, 0.1% are Sikh, 0.7% belong to another religion, 42.5% have no religion and 8.2% did not state their religion. In both the 2001 and 2011 censuses Norwich was found to be the least religious city in England, with the largest proportion of respondents with no reported religion, compared to 25.1% across England and Wales. The largest quinary group is 20 to 24-year-olds (14.6%) because of the large university student population. The city has 56 primary schools (including 16 academies and free schools) and 13 secondary schools, 11 of which are academies. The city's eight independent schools include Norwich School and the Norwich High School for Girls. There are also five special schools. The former Norwich High School for Boys, on Upper St Giles Street, has a blue plaque commemorating Sir John Mills who was a pupil there. Norwich has two universities, the University of East Anglia and Norwich University of the Arts. The student population of the city is around 15,000, many of whom come from overseas. The University of East Anglia was founded in 1963 and is located on the outskirts of the city. It is well known for its creative-writing programme, established by Malcolm Bradbury and Angus Wilson, whose graduates include Kazuo Ishiguro and Ian McEwan. The university campus is the home of the Sainsbury Centre for Visual Arts, which houses a number of important art collections. The Norwich University of the Arts dates back to 1845 as the Norwich School of Design. Founded by artists and followers of the Norwich School art movement, it was established to provide designers for local industries. Previously a specialist art school (as the Norwich School of Art and Design), it achieved university status in 2013. Norwich has three further education colleges. City College Norwich, situated on Ipswich Road, was founded in 1891 and is one of the largest colleges in the country. Access to Music is located on Magdalen Street at Epic Studios, and Easton & Otley College's Easton Campus is located 11 kilometres (6.8 mi) west of the city. Historically Norwich has been associated with art, literature and publishing, which continues to the present day. Norwich was the site of the first provincial library in England, which opened in 1608, and was the first city to implement the Public Libraries Act 1850. The Norwich Post was the first provincial newspaper outside London, first published in 1701. The Norwich School of artists was the first provincial art movement, with nationally acclaimed artists such as John Crome associated with the movement. Other literary firsts associated with the city include Julian of Norwich's Revelations of Divine Love, published in 1395, which was the first book written in the English language by a woman, and the first poem written in blank verse, composed by Henry Howard, Earl of Surrey, in the 16th century. Today the city is a regional centre for publishing, with 5% of the UK's independent publishing sector based in the city in 2012. In 2006 Norwich became the UK's first City of Refuge, part of the International Cities of Refuge Network (ICORN) which promotes free speech. Norwich made the shortlist for the first city to be designated UK City of Culture, but in July 2010 it was announced that Derry had been selected. In May 2012 Norwich was designated as England's first UNESCO City of Literature. Norwich is a popular destination for a city break; attractions include Norwich Cathedral, the cobbled streets and museums of old Norwich, Norwich Castle, Cow Tower, Dragon Hall and The Forum. Norwich is one of the UK's top ten shopping destinations, with a mix of chain retailers and independent stores as well as Norwich Market, one of the largest outdoor markets in England. It is ranked about the 150th biggest city in Europe. The Forum, designed by Michael Hopkins and Partners and opened in 2002 is a building designed to house the Norfolk and Norwich Millennium Library, a replacement for the Norwich Central Library building which burned down in 1994, and the regional headquarters and television centre for BBC East. For the seventh consecutive year since 2006 it has been the most visited library in the UK, with 1.3 million visits in 2013. The collections contains the 2nd Air Division Memorial Library, a collection of material about American culture and the American relationship with East Anglia, especially the role of the United States Air Force on UK airbases throughout the Second World War and Cold War. Much of the collection was lost in the 1994 fire, but the collection has been restored by contributions from many veterans of the war, both European and American. The building also provides a venue for art exhibitions, concerts and events, although the city still lacks a dedicated concert venue. Recent attempts to shed the backwater image of Norwich and market it as a popular tourist destination, as well as a centre for science, commerce, culture and the arts, have included the refurbishment of the Norwich Castle Museum and the opening of the Forum. The proposed new slogan for Norwich as England's Other City has been the subject of much discussion and controversy. It remains to be seen whether it will be finally adopted. A number of signs at the approaches to the city still display the traditional phrase: "Norwich — a fine city." The city promotes its architectural heritage through a collection of notable buildings in Norwich called the "Norwich 12". The group consists of: Norwich Castle, Norwich Cathedral, The Great Hospital, St Andrew's Hall and Blackfriars' Hall, The Guildhall, Dragon Hall, The Assembly House, St James Mill, St John the Baptist RC Cathedral, Surrey House, City Hall and The Forum. Each year the Norfolk and Norwich Festival celebrates the arts, drawing many visitors into the city from all over eastern England. The Norwich Twenty Group, founded in 1944, presents exhibitions of its members to promote awareness of modern art. Norwich was home to the first arts festival in Britain in 1772. Norwich Arts Centre is a notable live music venue, concert hall and theatre located in St Benedict's Street. OPEN in Bank Plain is a large, popular music and conference venue and the King of Hearts in Fye Bridge Street is another centre for art and music. Norwich has a thriving music scene based around local venues such as the University of East Anglia LCR, Norwich Arts Centre, The Waterfront, The Owl Sanctuary, Epic Studios and The Blueberry. Live music, mostly contemporary musical genres, is also to be heard at a number of other public house and club venues around the city. The city is host to many artists that have achieved national and international recognition such as Cord, The Kabeedies, Serious Drinking, Tim Bowness, Sennen, Magoo and KaitO. Norwich is also the home of jazz and blues vocalist Albert Cooper (born 1931), who has performed on innumerable occasions in the city since 1954. Norwich was selected to host the 2015 BBC Radio 1 Big Weekend. The event was held on 23–24 May in Earlham Park. British artist Stella Vine lived in Norwich from the age of seven, including for a short while in Argyle Street, Norwich and again later in life with her son Jamie. Vine depicted the city in a large painting, Welcome to Norwich a fine city (2006). Norwich has theatres ranging in capacity from 100 to 1,300 seats and offering a wide variety of programmes. The Theatre Royal is the largest and has been on its present site for nearly 250 years, through several rebuildings and many alterations. It has 1,300 seats and hosts a mix of national touring productions including musicals, dance, drama, family shows, stand-up comedians, opera and pop. The Maddermarket Theatre opened in 1921 and was the first permanent recreation of an Elizabethan theatre. The founder was Nugent Monck who had worked with William Poel. The theatre is a Shakespearean-style playhouse and has a seating capacity of 310. Norwich Puppet Theatre was founded in 1979 by Ray and Joan DaSilva as a permanent base for their touring company and was first opened as a public venue in 1980, following the conversion of the medieval church of St. James in the heart of Norwich. Under subsequent artistic directors — Barry Smith and Luis Z. Boy — the theatre established its current pattern of operation. It is a nationally unique venue dedicated to puppetry, and currently houses a 185-seat raked auditorium, the 50-seat Octagon Studio, workshops, an exhibition gallery, shop and licensed bar. It is the only theatre in the Eastern region with a year-round programme of family-centred entertainment. Norwich Arts Centre theatre opened in 1977 in St Benedict's Street, and has a capacity of 290. The Norwich Playhouse, which opened in 1995 and has seating capacity of 300, is a venue in the heart of the city and one of the most modern performance spaces of its size in East Anglia. The Whiffler Theatre was built 1981 and was given to the people of Norwich by the local newspaper group Eastern Daily Press. It is an open-air facility in Norwich Castle Gardens, with fixed-raked seating for up to 80 people and standing for another 30 on the balcony. The stage is brick-built and has its dressing-rooms set in a small building to stage left. The Whiffler mainly plays host to small Shakespeare productions. Sewell Barn Theatre is the smallest theatre in Norwich and has a seating capacity of just 100. The auditorium features raked seating on three sides of an open acting space. This unusual staging helps to draw the audience closely into the performance. Norwich has a number of important museums which reflect the rich history of the city and of Norfolk as well as wider interests. The largest is Norwich Castle Museum. This has extensive collections of archaeological finds from the county of Norfolk, of art (including a fine collection of paintings by the Norwich School of painters), of ceramics (including the largest collection of British teapots), of silver, and of natural history. Of particular interest are dioramas of Norfolk scenery, showing wildlife and landscape. It has been extensively remodelled to enhance the display of the many collections, and hosts frequent temporary exhibitions of art and other subjects. The Museum of Norwich (until 2014 called The Bridewell Museum), in Bridewell Alley, was closed in 2010 for a major refurbishment of the building and overhaul of the displays, and re-opened in July 2012. There are several galleries and groups of displays. These include "Life in Norwich: Our City 1900–1945"; "Life in Norwich: Our City 1945 Onwards"; and "England's Second City" depicting Norwich in the 18th century. "Made in Norwich", "Industrious City" and "Shoemakers" have exhibits connected with the historic industries of Norwich, including weaving, shoe and boot making, iron foundries and the manufacture of metal goods, engineering, milling, brewing, chocolate-making and other food manufacturing. "Shopping and Trading" contains exhibits from the early 19th century to the 1960s. Strangers' Hall, at Charing Cross, is one of the oldest buildings in Norwich: a merchant's house dating from the early 14th century. The many rooms are furnished and equipped in the styles of different eras, from the Early Tudor to the Late Victorian. Exhibits include costumes and textiles, domestic objects, children's toys and games, and children's books. The last two collections are considered to be of national importance. The Royal Norfolk Regimental Museum was, until 2011, housed in part of the former Shirehall, close to the castle. Although archives and the reserve collections are still held in the Shirehall, the principal museum display there closed in September 2011, and was relocated to the main Norwich Castle Museum, reopening fully in 2013. Its exhibits illustrate the history of the regiment from its 17th-century origins to its incorporation into the Royal Anglian Regiment in 1964, along with many aspects of military life in the regiment. There is an extensive and representative display of medals awarded to soldiers of the regiment, including two of the six Victoria Crosses won. The City of Norwich Aviation Museum is located at Horsham St. Faith, on the northern edge of the city and close to Norwich Airport. There are static displays of both military and civil aircraft, together with various collections of exhibits, including one concerned with the United States 8th Army Air Force. The John Jarrold Printing Museum, at Whitefriars, is dedicated to the history of printing and contains many examples of printing machinery, presses, books, and related equipment, and is considered to be of both national and international importance.Exhibits range in date from the early 19th century to the present day and, as well as static exhibits, machinery and equipment is demonstrated in use. Many were donated by Jarrold Printing. In November 2018, redevelopment plans for the museum site caused some uncertainty about its future, but it has been announced that the museum will be relocated in the new development. However, the proposed new museum will occupy a considerably smaller space, and concerns remain about the future number and scope of the exhibits. Of particular concern is the possible loss of the facility to demonstrate working machinery. Dragon Hall, in King Street, is a fine example of a medieval merchants' trading hall. Mostly dating from about 1430, it is unique in Western Europe. In 2006 the building underwent a thorough restoration. Its magnificent architecture is complemented by displays showing the history of the building and its role in the life of Norwich through the ages. The Norfolk Museums and Archaeology Service Costume and Textiles Study Centre, at the Shirehall in Market Avenue, contains an extensive collection of more than 20,000 items, built up over a period of some 130 years, and previously kept in other Norwich museums. Although not a publicly open museum in the usual sense, the collection is accessible to the general public, students, researchers and others by prior appointment. Norwich has three cinema complexes. Odeon Norwich is located in the Riverside Leisure Centre, Vue in the Castle Mall and Hollywood Cinema at Anglia Square, north of the city centre. Cinema City is an art-house cinema showing non-mainstream productions operated by Picturehouse on St Andrews Street opposite St Andrew's Hall, whose patron was actor John Hurt. Owing to its agricultural history, Norwich has a large number of pubs throughout the city. Prince of Wales Road in the city centre, running from the Riverside district near Norwich railway station to Norwich Castle, is home to many pubs, bars and clubs. Norwich is the headquarters of BBC East, its presence in the east of England, and BBC Radio Norfolk, BBC Look East, Inside Out and The Politics Show are all broadcast from BBC studios in The Forum. Independent radio stations based in Norwich include Heart, Smooth Radio, 99.9 Radio Norwich, and the University of East Anglia's Livewire 1350, an online station. A community station, Future Radio, was launched on 6 August 2007. ITV Anglia, formerly Anglia Television, is based in Norwich. Although one of the smaller ITV companies, it supplied the network with some of its most popular shows such as Tales of the Unexpected, Survival and Sale of the Century (1971–1983), which began each edition with John Benson's enthusiastic announcement: "And now from Norwich, it's the quiz of the week!" The company also had a subsidiary called Anglia Multimedia, which produced educational content on CD and DVD mainly for schools, and was one of the three companies, along with Granada TV and the BBC vying for the right to produce a digital television station for English schools and colleges. Launched in 1959, Anglia Television lost its independence in 1994 following a takeover by Meridian Broadcasting and subsequent mergers have seen it reduced from a significant producer of programmes to a regional news centre. The company is still based in Anglia House, the former Norfolk and Norwich Agricultural Hall, on Agricultural Hall Plain near Prince of Wales Road. However, despite the contraction of Anglia, television production in Norwich has by no means ended. Anglia's former network production centre at Magdalen Street has been taken over by Norfolk County Council and extensively re-vamped. After total investment of £4m from the East of England Development Agency (EEDA) it has re-opened as Epic Studios (East of England Production Innovation Centre). Degree courses in film and video are also run at the centre by Norwich University of the Arts. Epic has commercial, broadcast quality post-production facilities, a real-time virtual studio and a smaller HD discussion studio. The main studio opened as an HD facility in November 2008. Throughout 2008, the centre has concentrated on the development of new TV formats and has worked on pilot shows with Les Dennis, Gaby Roslin and Christopher Biggins. Archant publishes two daily newspapers in Norwich, the Norwich Evening News, and the regional Eastern Daily Press (EDP), and had its own television operation, Mustard TV, which has now closed. The character of Alan Partridge in the sitcom I'm Alan Partridge (1997–2002) and the comedy film Alan Partridge: Alpha Papa (2013) is a Norwich broadcaster played by Steve Coogan. Norwich was also the residence of the physician and hermetic philosopher Sir Thomas Browne, author of The Garden of Cyrus (1658). Many influential esoteric books-titles are listed as once in Browne's library. His coffin-plate, on display at the church of St Peter Mancroft, alludes to Paracelsian medicine and alchemy. Translated from Latin it reads, Great Virtues, … sleeping here the dust of his spagyric body converts the lead to gold. Browne is also a significant figure in the history of physiognomy. The Church of St John Maddermarket's graveyard includes the Crabtree headstone, which has the pre-Christian symbol of the Ouroboros along with Masonic Square and Compasses carved upon it. Housed within the church there is the Layer Monument, a rare example of an alchemical mandala in European funerary art. From 1787 the congregation of the New Jerusalem Church of Swedenborgians, followers of the mystic Emanuel Swedenborg, worshipped at the church of St. Mary the Less; in 1852 they moved to Park Lane, Norwich to establish the Swedenborgian Chapel. Norwich has a wealth of historical architecture. The medieval period is represented by the 11th-century Norwich Cathedral, 12th-century castle (now a museum) and a large number of parish churches. During the Middle Ages, 57 churches stood within the city wall; 31 still exist today, and seven are still used for worship. This gave rise to the common regional saying that it had a church for every week of the year, and a pub for every day. Norwich is said to have more standing medieval churches than any city north of the Alps. The Adam and Eve pub is believed to be the oldest pub in the city, with the earliest known reference made in 1249. Most of the medieval buildings are in the city centre. Notable examples of secular medieval architecture are Dragon Hall, built in about 1430, and The Guildhall, built 1407–1413, with later additions. From the 18th century the pre-eminent local name is Thomas Ivory, who built the Assembly Rooms (1776), the Octagon Chapel (1756), St Helen's House (1752) in the grounds of the Great Hospital, and innovative speculative housing in Surrey Street (c. 1761). Ivory should not be confused with the Irish architect of the same name and similar period. The 19th century saw an explosion in Norwich's size and much of its housing stock, as well as commercial building in the city centre, dates from this period. The local architect of the Victorian and Edwardian periods who has continued to command most critical respect was George Skipper (1856–1948). Examples of his work include the headquarters of Norwich Union on Surrey Street; the Art Nouveau Royal Arcade; and the Hotel de Paris in the nearby seaside town of Cromer. The neo-Gothic Roman Catholic cathedral dedicated to St John the Baptist on Earlham Road, begun in 1882, is by George Gilbert Scott Junior and his brother, John Oldrid Scott. The city continued to grow through the 20th century, and much housing, particularly in areas further out from the city centre, dates from that century. The first notable building post-Skipper was the City Hall by CH James and SR Pierce, opened in 1938; at the same time, they moved the City War Memorial, designed by Sir Edwin Lutyens, to sit in a memorial garden between the city hall and the market place. Bombing during the Second World War, while resulting in relatively little loss of life, caused significant damage to housing stock in the city centre. Much of the replacement postwar stock was designed by the local authority architect, David Percival. However, the major postwar development in Norwich from an architectural point of view was the opening of the University of East Anglia in 1964. Originally designed by Denys Lasdun (his design was never completely executed), it has been added to over subsequent decades by major names such as Norman Foster and Rick Mather. Elm Hill is an intact medieval street. Cow Tower stands on the banks of the River Wensum. Chapelfield Gardens in central Norwich became the city's first public park in November 1880. From the start of the 20th century, Norwich Corporation, now Norwich City Council, began buying and leasing land to develop parks when funds became available. Sewell Park and James Stuart Gardens are examples of land donated by benefactors. After World War I the corporation took advantage of government grants and made the decision to construct a series of formal parks as a means to alleviate unemployment. Under the guidance of Parks Superintendent Captain Sandys-Winsch four parks were completed; Heigham Park (1924), Wensum Park (1925), Eaton Park (1928), Waterloo Park (1933). These parks retain many features from Sandys-Winsch's original plans and have been placed on the English Heritage Register of Parks and Gardens of Special Historic Interest. As of 2015, the city has 23 parks, 95 open spaces and 59 natural areas managed by the local authority. In addition there are several privately owned gardens which are occasionally opened to the public in aid of charity with the exception of the Plantation Garden located close to the St John the Baptist Cathedral which opens daily. The principal local football club is Norwich City, also known as the Canaries, who play in the second tier of English football, the Championship, after being relegated from the Premier League at the end of the 2015–16 season. Majority-owned by celebrity chef Delia Smith and her husband Michael Wynn-Jones, their ground is at Carrow Road. They have a strong East Anglian rivalry with Ipswich Town. The club has enjoyed considerable success in the past, having played in the top division regularly since 1972, their longest spell being a nine-year run from 1986 to 1995. They have also won two Football League Cups, and finished third in the inaugural Premier League in 1993. They were relegated two years later and did not reclaim their top flight place for nine years, going down again after just one season, only to return in 2011 after two successive promotions. Perhaps Norwich City's most famous result to date came later in 1993 when they eliminated German giants Bayern Munich from the UEFA Cup, in what is to date their only season in European competitions; they had qualified for the UEFA Cup three times between 1985 and 1989 but were unable to compete as there was a ban on English clubs in European competitions at the time. Before emerging as a top division club, they famously eliminated Manchester United from the FA Cup in 1959, and went on to reach the semi-finals of the competition, a run they achieved again in 1989 and most recently in 1992. In the 1980s and early 1990s, the club produced some of the most highly rated talent of that era, including striker Chris Sutton, winger Ruel Fox, defender Andy Linighan, midfielder Mike Phelan, midfielder Tim Sherwood and striker Justin Fashanu. The club's most successful managers have included Ken Brown, Ron Saunders, Dave Stringer, Mike Walker, Nigel Worthington and Paul Lambert. The city's second club, Norwich United (who are based in Blofield some 8 kilometres (5.0 mi) east of the city) and Norwich CBS play in the Eastern Counties League. The now-defunct Gothic were also based in Norwich. Local football clubs are served by the Norwich and District Saturday Football League. Norwich also has five field hockey clubs. In the 2012/13 season the club playing the highest level on the men's side will be Norwich City Hockey Club in the East Hockey Premier B, which is two levels below National League. The second highest level is Norwich Dragons in Division Two North, then the students only University of East Anglia Men's Hockey Club in Division Three North East, then Norfolk Nomads Men's Hockey Club in Division Six North East. On the Ladies' side of the game both Norwich City Hockey Club and Norwich Dragons Hockey club play in East Hockey's Division One North, two levels below National League. Following them the students from the University of East Anglia Women's Hockey Club play in the Norfolk Premier Division. Also in Norwich there is the veterans only side Norwich Exiles. Outside the city boundary, the dry ski and snowboarding slopes of Norfolk Ski Club is located at Whitlingham Lane in Trowse. Located close by in the parish of Whitlingham is the Whitlingham Country Park home to the Outdoor Education Centre. The centre is based on the south bank of the Great Broad which is also used by scuba divers from one of the city's three diving schools and other water and land sports. Norwich has two main rowing clubs in the Yare Boat Club, which is the older but smaller of the two, based on an island on the River Yare accessed from beside the Rivergarden pub on Thorpe Road in Norwich; and Norwich Rowing Club which is larger and, in partnership with Norwich Canoe Club, UEA Boat Club, Norwich School Boat Club and Norwich High School Rowing Club, has recently built a new boat house alongside Whitlingham Little Broad and the River Yare. Norwich Canoe Club specialise in sprint and marathon racing. They hold the highest British Canoe Union Top Club Gold accreditation and are one of the more successful clubs in the UK. Ian Wynne, 2004 Olympics K1 500m bronze medallist, is an honorary member of the club. Speedway racing was staged in Norwich both before and after World War II at The Firs Stadium on the Holt Road, Hellesdon. The Norwich Stars raced in the Northern League of 1946 and the National League Division Two between 1947 and 1951, winning it in 1951. They were subsequently elevated to the National League and raced at the top flight until the stadium was closed at the end of the 1964 season. One meeting was staged at a venue at Hevingham but the event, staged without an official permit, did not lead to a revival of the sport in the Norwich area. In the world of boxing, Norwich can boast former European and British lightweight champion Jon Thaxton, reigning English light heavyweight champion Danny McIntosh and heavyweight Sam Sexton, a former winner of the Prizefighter tournament. Based in Norwich-Herbie Hide has been WBO Heavyweight World Champion twice. He won the championship in 1994–95 and for a second time in 1997. Norwich was the second city of England (after London) for several centuries before industrialisation, which came late to Norwich due to its isolation and lack of raw materials[citation needed]. In November 2006 the city was voted the greenest in the UK. There is currently an initiative taking place to make it a transition town. Norwich has recently been the scene of open discussions in public spaces, known as "meet in the street", that cover social and political issues. Articles in the past have suggested that, compared with other UK cities, Norwich was top of the league for the percentage of population who use the popular Internet auction site eBay. The city also unveiled the biggest free Wi-Fi network in the UK, which opened in July 2006. In August 2007 Norwich was shortlisted as one of nine finalists in its population group for the International Awards for Liveable Communities (LivCom Awards). The city eventually won a silver award in the small city category. The Royal Arcade, designed by George Skipper, opened in 1899. Norwich's economy was historically manufacturing based, with a large shoemaking industry, but transitioned throughout the 1980s and 1990s to a service-based economy. The greater Norwich economy (which includes Norwich, Broadland and South Norfolk government districts) as measured by GVA was estimated at £7.4 billion in 2011 (2011 GVA at 2006 prices). The city's largest employment sectors are business and financial services (31%), public services (26%), retail (12%), manufacturing (8%) and tourism (7%). Unemployment in urban Norwich and the Norwich City Council area was 2.7% and 3.7% respectively in January 2014, compared to 3% across Great Britain. New developments on the former Boulton and Paul site include the Riverside entertainment complex with nightclubs and other venues featuring the usual national leisure brands. Nearby, the football stadium is being upgraded with more residential property development alongside the river Wensum. Norwich has long been associated with the manufacture of mustard. The world-famous Colman's brand, with its yellow packaging, was founded in 1814 and operates from its factory at Carrow, although that site is due to close by the end of 2019. Colman's is now exported worldwide by its parent company Unilever (Unilever UK Export), putting Norwich on the map of British heritage brands. The Colman's Mustard Shop, which sold Colman's products and related gifts, was, until 2017, located in the Royal Arcade in the centre of Norwich, but closed in that year without any prospect of it reopening elsewhere. To the south-west of the city is the Norwich Research Park, which as of 2012[update] is set to undergo a period of investment and expansion. The NRP comprises a community of research organisations with world-leading science credentials, including the Institute of Food Research and the John Innes Centre, as well as over 30 science and technology-based businesses, the University of East Anglia and the Norfolk and Norwich University Hospital. Norwich was the eighth most prosperous shopping destination in the UK in 2006. Norwich has an ancient market place, established by the Normans between 1071 and 1074, which is today the largest six-days-a-week open-air market in England. In 2006, the market was downsized and redeveloped, and the new market stalls have proved controversial: with 20% less floorspace than the original stalls, higher rental and other charges, and inadequate rainwater handling, which has been unpopular with many stallholders and customers alike. In 2007 the local Norwich Evening News characterised Norwich Market as an ongoing conflict between the market traders and Norwich City Council, which operates the market. A second shopping mall, Intu Chapelfield (formally known as Chapelfield) was opened in 2005 on the site of a closed Caley's (later Rowntree Mackintosh and Nestlé) chocolate factory. Chapelfield opened in September 2005, featuring as its flagship department store House of Fraser. Detractors have criticised Chapelfield as unnecessary and damaging to local businesses; its presence has prompted smaller retailers to band together to promote the virtues of independent shops. Despite this, in August 2006 it was reported by the Javelin Group that Norwich was one of the top five retail destinations in the UK, and in October 2006 the city centre was voted the best in the UK, in a shopping satisfaction survey run by Goldfish Credit Card. A section of central Norwich, in an area approximately bounded by Bethel Street/Upper St Giles Street, Grapes Hill, St Benedict's and St Andrew's Hill/London Street/Castle Meadow, forms a quarter now known, and promoted, as Norwich Lanes. A series of mostly-pedestrianised small lanes, alleyways and streets, it is noted for its independent retailers, and eating and drinking establishments. The area also contains a number of the city's cultural attractions, including museums, theatres and other venues. As part of a nationwide drive to recognise the importance, and to maintain the character and individuality of Britain's high streets, Norwich Lanes was the Great British High Street Awards 2014 national winner in the "City" category. To the north of the city centre is the Anglia Square shopping centre. The centre and the surrounding area is to be redeveloped; demolition work was due to commence in 2010 after an archaeological dig (conducted in 2009 and due to the centre being located around the site of a Saxon fortified settlement). The new development is planned to be a mixture of shops and housing, unlike the original which consisted of offices, shops and a cinema. In February 2009, it was announced that, due to the economic climate, plans for the area have been delayed and the developers are unable to say for certain when work will commence. In 2014, the centre was bought by investment manager Threadneedle Investments for £7.5 million. The current owners and their partner Weston Homes announced in November 2016, they have been holding talks with chief officers at Norwich City Hall. Plans submitted include the demolition of Anglia Square, the former stationery office and Gildengate House. More than 1000 homes are planned to be built above shop units and a new public square. In early 2018, Weston Homes and landowner Columbia Threadneedle submitted regeneration plans for the site. These include 1200 homes, major supermarket, hotel, green squares and central courtyards. Norwich stands north of the A47 (bypassed to the south of the city), which connects it with Great Yarmouth to the east, and Kings Lynn and Peterborough to the west. There are plans to upgrade the A47, especially sections that are still single-carriageway, prompted partly by the ongoing construction of Great Yarmouth Outer Harbour. Norwich is linked to Cambridge via the A11, which leads to the M11 motorway for London and the M25. It is linked to Ipswich to the south by the A140 and to Lowestoft to the south-east by the A146. Norwich has the UK's first not-for-profit city-wide car club. The bus companies serving Norwich include BorderBus, First Norfolk & Suffolk, Konectbus and Sanders Coaches. Destinations throughout Norfolk and beyond are served, as are Peterborough and Lowestoft. National Express run ten coaches a day to the three main London airports (Stansted, Heathrow and Gatwick), five a day to London, and one a day to Birmingham. Megabus also operate a daily service to London. Most bus and coach services run from Norwich bus station or from Castle Meadow. The Norwich park and ride network has six sites run by Konectbus. It is one of the larger UK park & ride operations. Almost 5,000 parking spaces are provided, and in 2006 3.4 million passengers used the service. Norwich Airport is a feeder to KLM's Schiphol hub. FlyBe, Eastern Airways all serve Norwich. Through Bristow Helicopters Norwich airport serves the offshore oil and gas industry. There is a strong holiday charter flight business. The airport was originally the airfield of RAF Horsham St Faith. One of the old RAF hangars was once the home of Air UK, which grew out of Air Anglia and was then absorbed by the Dutch airline KLM. National Cycle Route 1 passes through Norwich, linking Beccles and Fakenham (and eventually Dover and the Shetland Islands). The River Yare is navigable from the sea at Great Yarmouth up to Trowse, south of the city. From there the River Wensum is navigable into Norwich up to New Mills, and is crossed by the Novi Sad Friendship Bridge. Scheduled trips through the city and out to the nearby The Broads are run by City Boats from outside Norwich station and also Elm Hill. In June 2012, Norwich City Council gave permission for punting on the River Wensum. In 2017 the first part of a new 11-kilometre (6.8 mi) road, the Norwich Northern Distributor Road, linking from the A1067 to the north west of the city to the A47 road to the east of Norwich was opened. The remainder of the road opened in 2018. There is also discussion of building the Norwich Western Link section from the A1067 to the A47 southern bypass to the west, as originally proposed. Sustrans plans to build a bridge between the Riverside area and Whitlingham Country Park as part of the Connect2 project, using funds from the National Lottery. The country park is currently cut off from the main residential areas by the River Yare and River Wensum. Other proposals in the Norwich Transport Strategy include limiting traffic on some roads, introducing five rapid bus links into the city, and creating a train/tram link to the Rackheath eco-town. Sea fog clinging to the East Anglian coast, February 2008; Norwich is denoted by the yellow dot. Norwich, like the rest of the British Isles, has a temperate maritime climate. It does not suffer extreme temperatures, and benefits from rainfall fairly evenly spread throughout the year. Coltishall, about 18 kilometres (11 mi) to the northeast, was the nearest official met-office weather station for which records are available, although it ceased reporting in early 2006 – now Norwich airport provides readings. Norwich's position in East Anglia, jutting out into the North Sea can produce weather conditions that have less effect on other parts of the country, such as snow or sleet showers during the winter months on a northerly or easterly wind, or sea fog/haar during the summer half of the year. An example of Norwich being afflicted by sea fog is shown in the adjacent image. The highest temperature recorded at Coltishall was 33.1 °C (91.6 °F) during June 1976. However, go back further to 1932, and Norwich's absolute record high stands at 35.6 °C (96.1 °F). Typically the warmest day of the year should reach 28.8 °C (83.8 °F) and 9.9 days should register a temperature of 25.1 °C (77.2 °F) or higher. The nearest sunshine monitoring weather station for which records are available is Morley agricultural research centre, about 11 miles (18 km) southwest of Norwich city centre. For the 1961–90 period, it averaged 1558 hours of sunshine a year, a relatively high total for an inland part of the British Isles outside of southern England. In reality, given Norwich's position nearer to the coast and as such suffering from less convective cloud development during summer, true totals may even be slightly higher than this. In 1507 the poet John Skelton (1460–1529) wrote of two destructive fires in his Lament for the City of Norwich. Saraya-Jade Bevis, professional wrestler born 1992 and raised in Norwich, signed to WWE, performing as "Paige"
Delia Smith (born 1941), celebrity chef and joint majority owner of Norwich City F.C. ^ Hayes 1958 Quote: "a major city manufacturer, and government supporter, Robert Harvey Jr as writing on 12 March 1793: 'The consequences of this just and inevitable war visit this poor city severely and suspend the operations of the Dutch, German and Italian trade and the only lingering employment in the manufactory is the completion of a few Russian orders, and the last China cambletts which I hope will find encouragement in the new East India Charter. This languid trade has doubled our poor rate and a voluntary subscription of above £2,000 is found inadequate to the exigencies of the poor." ^ Lord Stanhope was a radical peer, seen by many at the time as a dangerous menace. He is said to have given his rabble-rousing speech in a Norwich public house in 1794. ^ Prior to the 20th century it was the practice that a sitting member, upon appointment to ministerial office, was obliged to seek re-election. ^ "Home". Norwich.gov.uk. 7 October 2010. Retrieved 13 September 2013. ^ Williams et al. 2006, p. 11. ^ a b c "Visit Norwich". www.visitnorfolk.co.uk. Retrieved 2018-08-29. ^ a b "2011 Census – Built-up areas". ONS. Retrieved 29 June 2013. ^ "Release Edition Reference Tables". Ons.gov.uk. 17 December 2012. Retrieved 13 September 2013. ^ a b "LI03 Local labour market indicators by Travel-to-Work Area" (XLS). Office for National Statistics. 2013. Retrieved 10 September 2013. ^ "Norwich named as UNESCO City of Literature". BBC. 10 May 2012. Retrieved 13 September 2013. ^ Seager, Charlotte (2016-02-02). "The 10 happiest cities to work in the UK – in pictures". The Guardian. ISSN 0261-3077. Retrieved 2018-09-03. ^ "What's it like to live in Norwich? | INTO". INTO Study. Retrieved 2018-09-03. ^ Times, The Sunday. "Best Places to Live 2018". ISSN 0140-0460. Retrieved 2018-09-17. ^ a b c Morley 2006. ^ Adams 2005, p. 11. ^ Historic England. "Norwich Castle (132268)". PastScape. Retrieved 29 December 2010. ^ Harfield 1991, pp. 373, 384. ^ a b Miller 1806. ^ a b "Jews in Norwich". Heritagecity.org. Archived from the original on 6 August 2013. Retrieved 13 September 2013. ^ Nilson 2001, p. 157. ^ Jewish Telegraphic Agency 2011. ^ "The Bodies in the Well". History Cold Case. Series 2. Episode 3. 28 June 2011. BBC HD. ^ Houlbroke & McClendon 2004, p. 257. ^ Fagel 2003, p. 52. ^ Pound 2004, pp. 50–56. ^ Pound 2004, p. 61. ^ a b c d e f Knights 2004, pp. 168–174. ^ Jewson 1975, p. 38. ^ Blackwell & Blackwell 2007, Chap 2. ^ Thompson 1968, p. 513. ^ Hayes 1958, pp. 242–243. ^ Jewson 1975, p. 66. ^ Norfolk Museums & Archaeology Service website Archived 24 March 2012 at the Wayback Machine—"Norwich Shawls"
^ "Britannia Barracks". Royal Norfolk Regiment Museum. Retrieved 9 November 2014. ^ "Norwich". Drill halls project. Retrieved 16 July 2017. ^ "Tom Smith Crackers". Tom Smith Crackers. Retrieved 13 September 2013. ^ "Caley's New Cocoa Cafe." Eastern Daily Press. Retrieved 17 July 2010. ^ Jarrold's store Archived 1 November 2009 at the Wayback Machine Retrieved 16 November 2009. ^ Norfolk Museums & Archaeology Service website Archived 27 July 2011 at the Wayback Machine — "Brewing in Norwich". ^ Betts, Marc. "The city of pubs – but more than 25 have closed in the past decade". Eastern Daily Press. Retrieved 2018-08-29. ^ a b "A History of Norwich - 20th Century Norwich". www.oldcity.org.uk. Retrieved 2018-08-05. ^ "Imagined futures past: '45 Plan - Invisible Works". Invisible Works. 2014-05-13. Retrieved 2018-08-05. ^ James, Derek. "Returning to the lost "village on the hill" in old Norwich". Norwich Evening News. Retrieved 2018-08-30. ^ James, Derek. "The real story behind Unthank Road". Evening News. ^ "Spydus - Image Display - Record 5 of 8". Civica. Norfolk County Council. Retrieved 2018-09-09. ^ a b c "News: Humps – another road". Autocar. 144 (4147): 2. 1 May 1976. ^ Local government in England and Wales: A Guide to the New System. London: HMSO. 1974. p. 72. ISBN 0-11-750847-0. ^ "The County of Norfolk (Electoral Changes) Order 2005" (PDF). Office of Public Sector Information. 1 February 2005. Retrieved 13 February 2010. ^ "The City of Norwich (Electoral Changes) Order 2002" (PDF). Office of Public Sector Information. 18 December 2002. Retrieved 13 February 2010. ^ "Local election results May 2016". Norwich City Council. ^ a b "Lord Mayor of Norwich". Norwich City Council. Archived from the original on 16 July 2011. Retrieved 13 February 2010. ^ "The King and Norwich". The Times. 7 February 1910. ^ "No. 46255". The London Gazette. 4 April 1974. p. 4400. ^ "Sheriff of Norwich". Norwich County Council. Archived from the original on 16 July 2011. Retrieved 13 February 2010. ^ "Local Government White Paper, Strong and Prosperous Communities". Norfolk County Council. Archived from the original on 1 August 2008. Retrieved 10 September 2009. ^ "The business case for unitary Norwich". Norwich City Council. Archived from the original on 7 December 2008. Retrieved 13 February 2010. ^ "Proposals for future unitary structures: Stakeholder consultation". Communities and Local Government. Archived from the original on 19 September 2012. Retrieved 13 February 2010. ^ "Our advice to the Secretary of State on unitary local government in Norfolk (PDF Document)" (PDF). The Boundary Committee. 7 December 2009. Archived from the original (PDF) on 11 January 2012. ^ "Minister's Statement of 10 February 2010". Communities and Local Government. Archived from the original on 4 March 2010. Retrieved 13 February 2010. ^ "Unitary Authorities". House of Commons Hansard Debates. Parliament of the United Kingdom. 24 February 2009. Retrieved 13 February 2010. ^ "Peter Housden's letter in full". Eastern Daily Press. 12 February 2010. ^ Shaun Lowthorpe (2 February 2010). "At last, a verdict on Norfolk councils' future". Eastern Daily Press. ^ Lowthorpe, Shaun (14 May 2010). "Government chief moves to axe Norwich unitary plans". Eastern Daily Press. ^ "Pickles stops unitary councils in Exeter, Norwich and Suffolk". Department for Communities and Local Government. Retrieved 25 July 2010. ^ "September by-elections for Exeter and Norwich". BBC News. 19 July 2010. Retrieved 19 July 2010. ^ Youngs 1980, p. 751. ^ "Norwich North". The Guardian. Politics. London. Retrieved 13 February 2010. ^ "Norwich South". The Guardian. Politics. London. Retrieved 13 February 2010. ^ "Clarke Out as Lib Dems win Norwich South". Eastern Daily Press. Retrieved 7 May 2010. ^ "Labour win Norwich South on night of misery for Lib Dems". Retrieved 9 May 2015. ^ "General Election 2017; What happened in Norfolk and Waveney?". "Eastern Daily Press"". Retrieved 14 August 2017. ^ "Norwich District: Total Population". A Vision of Britain Through Time. Great Britain Historical GIS Project. Retrieved 26 February 2014. ^ a b United Kingdom Census 2011. "Norwich (Local Authority)". Office for National Statistics. Retrieved 24 February 2014. Nb. Only used for 2011 data. ^ "2011 Census: Ethnic group, local authorities in England and Wales". ONS. Retrieved 10 March 2014. ^ "2011 Census: Religion, local authorities in England and Wales". United Kingdom Census 2011. Office for National Statistics. Retrieved 26 February 2014. ^ a b John Welch (12 December 2012). "Census shows Norwich 'least religious city' in England and Wales". BBC News. Retrieved 8 February 2014. ^ a b "Search Results – Compare School Performance". Gov.uk. Retrieved 25 February 2017. ^ "SchoolFinder". Norfolk County Council. Retrieved 1 February 2014. ^ "John Mills blue plaque in Norwich". Blue Plaque Places. ^ "Norwich". Complete University Guide. Archived from the original on 3 February 2014. Retrieved 1 February 2014. ^ Marszal, Andrew (17 April 2013). "City College Norwich Guide". The Telegraph. London. Retrieved 1 February 2014. ^ a b c d e "10 things to know about Norwich" (PDF). UNESCO. November 2012. Retrieved 26 February 2014. ^ "Londonderry named the UK City of Culture". BBC News. 15 July 2010. Retrieved 15 July 2010. ^ Bury, Liz (11 December 2013). "Norfolk & Norwich Millennium tops list of most popular UK libraries". The Guardian. London. Retrieved 25 February 2014. ^ www.silkpearce.com, Silk Pearce. "Norfolk & Norwich Festival - About us - History". ^ "All Sorted !?! Records". Label owner Dudley Garner. East Anglian Music Archive. Archived from the original on 23 July 2012. Retrieved 27 April 2011. ^ Lynn Barber (9 July 2007). "Vine Times". The Guardian. London. Retrieved 13 September 2013. ^ Eastern Evening News—"Work begins on Norwich Bridewell Museum"
^ Eastern Daily Press 1 March 2011– "Re-opening of Norwich's Bridewell Museum delayed." ^ Eastern Daily Press 28 June 2012–"Click-clack sound to return to Norwich …"
^ BBC Norfolk News 26 July 2011 "-Royal Norfolk Museum Moves to Norwich Castle"
^  "Printing Historical Society Jarrold Press Release 19 November 2018"
^ BBC Norfolk news 5 October 2018 "Norwich printing museum: Owners seek new location"
^ Norwich Evening News 24 November 2018"Norwich printing museum to relocate amid demolition plans"
^ Eastern Daily Press 4 January 2019 "Print Museum pledge fails to quell objections"
^ Eastern Daily Press 14 March 2019 "I’ve never been there’ - chairman’s museum confession ahead of sealing its fate"
^ Meddings, Sabbah (29 March 2013). "John Hurt announced as new patron of Norwich's Cinema City". Eastern Daily Press. Retrieved 26 February 2014. ^ Fleay 1891, pp. 251–252. ^ "Norwich Churches – Map". Norwich Churches. Archived from the original on 24 June 2015. Retrieved 28 May 2015. ^ Adrian Tierney-Jones (12 March 2012). "Pint to pint: Adam and Eve, Norwich". The Telegraph. London. Retrieved 8 February 2014. ^ "1. Adam and Eve". Eastern Daily Press. 14 April 2010. Archived from the original on 22 February 2014. Retrieved 8 February 2014. ^ "DiveNorwich – scuba diving". Divenorwich.com. Archived from the original on 29 May 2013. Retrieved 13 September 2013. ^ Davies, Gareth A (6 October 2008). "Thaxton rolls back the years". London: Telegraph.co.uk. Retrieved 13 September 2013. ^ "BBC Sport | Sexton joins the big guns". Bbc.co.uk. 14 July 2007. Retrieved 13 September 2013. ^ Powles, David (13 November 2006). "Norwich voted greenest place in UK". Norwich Evening News (Press release). Retrieved 14 November 2006. ^ "Meet in The Street – Positive Change through Public Discussion". Freewebs.com. Archived from the original on 22 October 2012. Retrieved 26 March 2013. ^ "Norwich is eBay capital of UK" (Press release). eBay.co.uk. 2 February 2005. Retrieved 23 April 2006. ^ Oates, John (2 August 2006). "Norwich turns on UK's largest Wi-Fi network". theregister.co.uk. Retrieved 5 August 2006. ^ Montague, Ros. "Norwich Shoemaking: From Howlett and White to Norvic". Norfolk Record Office Blog. Norfolk Record Office. Retrieved 3 March 2017. ^ Greater Norwich Development Partnership. "An Economic Assessment of Greater Norwich – 2012" (PDF). p. 10. Archived from the original (PDF) on 7 March 2014. Retrieved 28 February 2014. ^ "Population and Employment Figures". Norwich City Council. Archived from the original on 18 February 2014. Retrieved 3 February 2014. ^ Norwich City Council (February 2014). "Norwich Economic Barometer" (PDF). Archived from the original (PDF) on 7 March 2014. Retrieved 7 March 2014. ^ Kollewe, Julia (2018-01-04). "Unilever to close 160-year-old Colman's Mustard factory in Norwich". the Guardian. Retrieved 2018-02-09. ^ "Norwich mustard shop won't reopen". Eastern Daily Press. Retrieved 6 October 2017. ^ Jenkinson, Caroline (19 August 2006). "New centre sees city climb shops league". Norwich Evening News. Retrieved 21 August 2006. ^ Chessum, Dominic (13 October 2006). "Norwich is top of the shops". Norwich Evening News. Archived from the original on 29 September 2007. Retrieved 29 October 2006. ^ "Norwich Lanes wins national high street award". Eastern Daily Press. 8 November 2014. Retrieved 18 November 2014. ^ "Development plannings". www.eveningnews24.co.uk. Retrieved 4 September 2016. ^ Dan Grimmer (2 November 2016). "Norwich's Anglia Square could be demolished as revamp plans, including 1000 homes, are revealed". Eastern Daily Press. Retrieved 10 January 2017. ^ "Anglia Square and the surrounding area". Norwich City Council. Retrieved 10 January 2017. ^ David Hannant (15 March 2018). "'My hope is for a common sense approach'- Reaction to plans for Anglia Square". Eastern Daily Press. Retrieved 24 April 2018. ^ "Norfolk car club". Norfolk car club. Retrieved 13 September 2013. ^ "Work starts on new park and ride". news.bbc.co.uk. 19 June 2004. Retrieved 29 September 2010. ^ "Norwich Park & Ride". Retrieved 15 August 2018. ^ "Norfolk County Council – Park and Ride". norfolk.gov.uk. Archived from the original on 30 August 2010. Retrieved 29 September 2010. ^ "How NDR will help transport in Norwich". Evening News 24. Retrieved 6 January 2010. ^ "Norwich, Connections to Whitlingham County Park". Retrieved 23 November 2009. ^ "NDR is key to transport plans". Evening News 24. Retrieved 6 January 2010. ^ "1976 Maximum". Retrieved 1 March 2011. ^ "Temperature records by county". Archived from the original on 4 June 2011. Retrieved 1 March 2011. ^ "1971-00 Annual average max temp". Retrieved 1 March 2011. ^ "Max >25c days". Retrieved 1 March 2011. ^ "January 1979 minimum". Retrieved 1 March 2011. ^ "1971-00 Annual average min temp". Retrieved 1 March 2011. ^ "1971-00 Annual average air frost". Retrieved 1 March 2011. ^ "December 2010". Retrieved 1 March 2011. ^ "1961–90 average sunshine". Retrieved 1 March 2011. ^ "Climate Normals 1981–2010". Met Office. Retrieved 4 August 2015. ^ "Carol Barnes: Authoritative television journalist who anchored 'News at Ten'". The Independent. London. 10 March 2008. Retrieved 4 September 2013. ^ Faulder, Carolyn (12 April 2018). "Pat Barr obituary". The Guardian. Retrieved 6 February 2019. ^ Jackie Wullschlager (20 July 2007). "Where art history meets Hello!". Financial Times. Retrieved 30 December 2017. ^ "British towns twinned with French towns". Archant Community Media Ltd. Retrieved 11 July 2013. ^ "Twinning Leaflet" (PDF). Norwich City Council. Archived from the original (PDF) on 3 February 2014. Retrieved 1 February 2014. Adams, David (2005). An Archaeological Evaluation at 17–27 Fishergate, Norwich, Norfolk (PDF). NORFOLK ARCHAEOLOGICAL UNIT. doi:10.5284/1002151. Blackwell, Michael P.; Blackwell, Carole A. (2007). Norwich Theatre Royal – The First 250 years. with a foreword by Harriet Walter. Norwich: Connaught. ISBN 978-0955745409. Chandler, D. (1998). "The Conflict: Hannah Brand and Theatre politics in the 1790s". Romanticism on the net (12). doi:10.7202/005819ar. Cundall, Herbert Minton (1920). Holme, Charles Geoffrey, ed. The Norwich School. The Studio. OCLC 1356134. Faulkner, Kevin (2013). "The Layer Monument". Pride. Fleay, Frederick Gard (1891). A biographical chronicle of the English drama, 1559–1642. Reeves and Turner. Jewish Telegraphic Agency, Toby Axelrod (27 June 2011). "Jewish bones found in medieval well in England". Archived from the original on 25 July 2015. Retrieved 17 October 2016. Ketton-Cremer, Robert Wyndham (1957). The Coming of the Strangers. Norfolk assembly. Faber and Faber. OCLC 2768949. Martineau, Harriet (1870). Biographical Sketches 1852–1868. Macmillan. Morley, Sarah (23 June 2006). "10-Year Archaeological Project For Caistor Roman Town". Culture24. Archived from the original on 2 January 2016. Retrieved 11 January 2013. Stoker, David A. (1981). "Anthony de Solempne: attributions to his press". The Library. OUP / Bibliographical Society. s6–3 (1): 17–32. doi:10.1093/library/s6-3.1.17. Archived from the original on 2 February 2017. Retrieved 18 October 2016. Thompson, Edward Palmer (1968). The Making of the English Working Class. Harmondsworth. ISBN 978-0140210002. Thompson, Edward Palmer (1994). "Hunting the Jacobin Fox". Past & Present. OUP / The Past and Present Society. 142 (1): 94–140. doi:10.1093/past/142.1.94. Williams, Laura; Jones, Alexandra; Lee, Neil; Griffiths, Simon (2006). "Enabling Norwich in the Knowledge Economy". Ideopolis: Knowledge City-Regions. Lancaster University: The Work Foundation. Retrieved 14 July 2017. Wikivoyage has a travel guide for Norwich. Wikimedia Commons has media related to Norwich. Wikisource has the text of a 1921 Collier's Encyclopedia article about Norwich. "Norwich, a city, capital of the county of Norfolk, England" . The American Cyclopædia. 1879.